akupofkatie: MY tips and terms to March Madness! MY tips and terms to March Madness! You'd think it's Christmas morning in our house today! The MVP is giddy like a child over MARCH MADNESS. This is the one weekend that we were NOT allowed to get married, not allowed to be on vacation away from a TV, and not allowed to ask to do honey-do's. You know when you are dating and you ask all those silly questions like whats your favorite color, food, and holiday??? Well, when it came to holiday, his response was "March Madness". At the time I was perplexed, for I didn't know March Madness existed in the holiday category. Six years later, still a bit perplexed, we (including Halo) celebrate March Madness as a holiday in our home. MVP sets aside vacation days, I however, am going to work. BOO HOO. Over the last six years I've gone from amateur to a seasoned vet when it comes to The Big Dance. So ladies and gents, here's some terms and tips I'm quite proud of. 4. Always pick a 12 over 5 upset. ALWAYS. 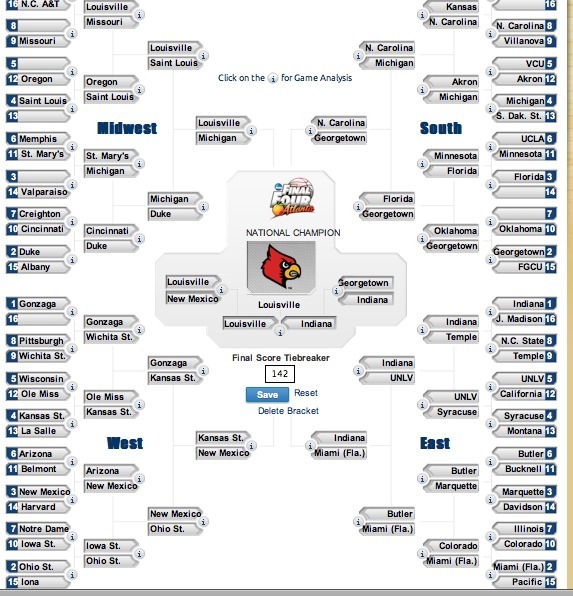 Here's my bracket...It's on like Donkey Kong! Haha I'm rooting the rebels go far!! Let the games begin!